Last week we announced that ArtPrize will be producing a new kind of public art exhibition in 2019, called Project 1, and shifting ArtPrize to a biennial schedule to make room for this new series of large scale commissions between each ArtPrize. Today I want to offer some thoughts about the location we chose to deliver the news. 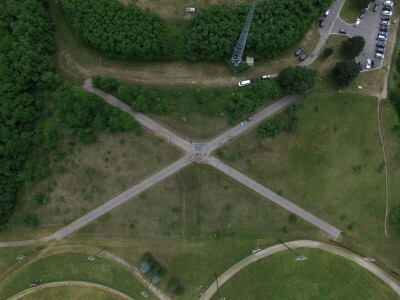 We made the announcement at Grand Rapids’ Belknap Park, home to a giant asphalt “X” inscribed in a hillside, the work of American sculptor Robert Morris. 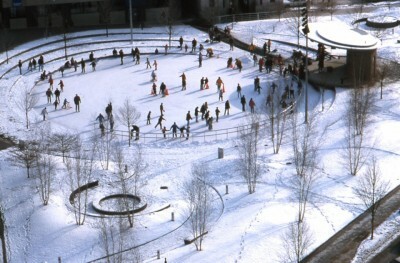 The piece, titled Grand Rapids Project—often referred to as Grand Rapids Project "X"—is a monumental earthwork that was originally conceived as a part of the influential 1973 exhibition Sculpture Off The Pedestal, but wasn’t completed until 1974. 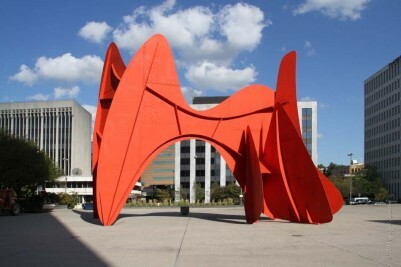 The exhibition was organized by The Women’s Committee of the Grand Rapids Art Museum, the same group that was instrumental in securing NEA funding for the commission of Alexander Calder’s La Grande Vitesse four years earlier. Project X, and the aptly titled Sculpture Off the Pedestal, occurred at a time when artists were radically rethinking the way art occupied and defined public space. Morris was interested in the way a sculpture could be an environment that had to be experienced, rather than just an object to see. 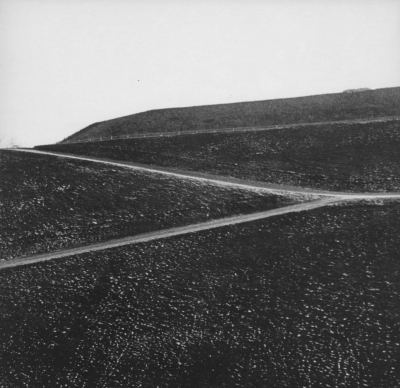 “Morris’ work took relationships out of the work,” wrote David Hopkins, “and made them a function of space, light, and the viewer’s field of vision.” Project X is a path for walking and climbing, a viewing platform, and an intentional blurring of the lines between sculpture, infrastructure, and landscape design. Project X is enormous but it’s surprisingly hard to see. Standing at the bottom of the hill looking up at it, it barely registers. Unlike Calder’s La Grande Vitesse, Project X resists our attempts to see it as a unified image. It’s difficult to reduce to an image because in order to experience it we have to move through it in space and time. This is by design. Compared to La Grand Vitesse, Project X is the Grand Rapids public art b-side, a deep cut, a lost track. Project X is the yin to La Grand Vitesse’s yang. While Calder’s stabile effortlessly flattens into a distinct silhouette, lending its curves to countless t-shirt designs and logos, the X is stubborn in its refusal to be visually legible. It doesn’t translate to a logo. Even if we try to reduce it to an image, it becomes only an X, a symbol that denotes cancellation and void. But Project X never became a central focus for much of anything, and it certainly isn’t a part of most citizens’ everyday lives. Walking its cracked, weedy surface, it’s hard to see it as anything other than a modern ruin, a weathered echo of a grand idea from long ago. Oosting’s description of a “central focus” of art and public space for which the city can be proud sounds more like a description of a work commissioned a quarter century later: Maya Lin’s Ecliptic at Rosa Parks Circle, completed in 2001. Lin’s piece also suffers from a lack of public knowledge about its presence and significance, but this is because it functions as a utilitarian public space so well that for most visitors it fails to register as an artwork at all. Project X is both overlooked and rarely visited, which is what makes it so intriguing. Climbing the X, reading the plaque that’s tucked awkwardly behind a shipping container holding sports equipment near the baseball diamonds at its base, admiring the form on Google Maps satellite view, it all feels like a mix of ritual and archeology. For those of us thinking about how art makes a city and how a city makes art, it’s a reminder that whatever we build here has to contend with whatever is already here. Project X exists in an important local and international lineage of artworks that rewrote the rules of art, viewer and public space. The sort of participatory projects that thrive at ArtPrize—and even the format of ArtPrize itself—are deeply indebted to Morris’ desire to make work that drew viewers into a direct, experiential, subjective encounter with art. Sculpture came off the pedestal and never looked back. The X is a reminder that the push to redefine what art can be in the public sphere is not only baked into the culture of Grand Rapids, it’s literally embedded in the ground. So why announce project Project 1 on top of an artwork that apparently failed? Because it’s never that simple. The best art—the art most worthy of our sustained attention, investigation and contemplation—is the art that fails and succeeds simultaneously in complicated and interconnected ways. Making things with meaning is a tricky business. Nothing does exactly what we want it to, and nothing does only what we want it to. There are always qualities that are unintended, generative, and emergent. Artists try to communicate through artworks, and art workers like us communicate through the way we organize exhibitions, but the things we make inevitably communicate on their own, too. Somehow, even without agency, they develop their own voice beyond what we try to say through them. Project X is a site for thinking about how this works. Project X is a monument to the idea that art sits at the center of the ever-changing process of making and remaking our city.